Leawo Software Co., Ltd is releasing its Spring Promotion from 27th of January. In this promotion, Leawo Software brings several best-selling products for all the customers. Leawo Software Co., Ltd is a professional software developing company that provides helpful software for our daily lives. In this Spring Promotion, Leawo Software will firstly give away Leawo iTransfer for all the users. 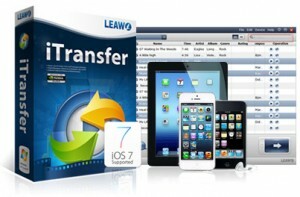 Leawo iTransfer could act iPod data transfer, iPad data transfer and iPhone data transfer. Different from an iPhone data recovery  that recovers deleted or lost files for iOS devices, this iPod/iPad/iPhone iTransfer  software is used for transferring files among iOS devices, iTunes and PCs, and it helps users get rid of the sync of iTunes. If you are an iPhone, iPad or iPod user, this software will be very helpful for you. The giveaway of Leawo iTransfer will last from Jan. 27 to Feb. 12, and anyone interested can get this powerful software with no efforts. Along with the giveaway of Leawo iTransfer, Leawo Software also gives out big discounts for several pieces of other software. If you are looking for a powerful video converter, you don’t want to miss Leawo Total Media Converter Ultimate. This software meets all your needs of video conversions; if you want to copy or shrink Blu-ray/DVD discs, Leawo Blu-ray Copy  will provide great help on this issue. Both of these two pieces of software are on sale with big discounts – Leawo Total Media Converter Ultimate is 40% off with the price $59.97, and Leawo Blu-ray Copy is 33% off with $29.67. If you purchase both of them, you can enjoy 50% off with $72.45. Leawo Software also delivers discounts for Leawo Video Converter Ultimate and Leawo Music Recorder. Leawo Video Converter Ultimate will be $19.98 with 60% off, and Leawo Music Recorder will be $9.99 with 50% off. If you buy both pieces of the software, you will enjoy 64% off with the price of $25. Leawo Video Converter Ultimate is helpful for the video conversions, and Leawo Music Recorder allows you to record any music it captures, and it automatically adds tags into the song. What’s more, Leawo Software provides 30% discount for other pieces of software, including Leawo Blu-ray Ripper for $31.46, Leawo Blu-ray Creator for $ 27.96, Leawo PowerPoint to Video Converter Pro for $ 31.46 and Leawo Tunes Cleaner for $27.99. All of the software will provide you help in specific fields, if you are interested, you won’t want to miss the chance. Leawo Software is starting the Spring Promotion from 27th of January, and all the products with discounts will be listed so that users can get them with ease. The Spring Promotion of Leawo won’t close until the last minute on 12th of February. If you are interested, please refer to the official web page of Leawo Spring Promotion: http://www.leawo.org/promotion/special-offer/ .